Yesterday, the news of a special Asteroid Day event by the Diego Portales University‘s (Universidad Diego Portales) Astronomy Hub reached us here at Asteroid Day HQ. The faculty – having made previous efforts to promote inclusivity – organised an inclusive talk and workshop at the university aimed specifically at children with visual impairments. The event took place at a school for blind people on the 30th June with about 30 participants. The goal was not only to educate people about asteroids, but also to raise awareness for the need of inclusive education and didactic teaching methods for astronomy. 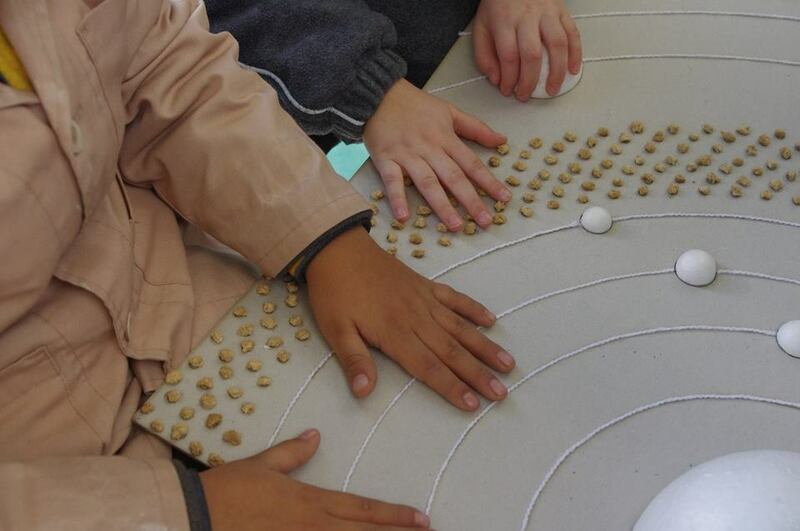 The organisers used tactile models as main teaching tool and incorporated sounds in creative ways to appeal to the visually impaired kids’ other senses. Thus, they managed to simulate both the formation and impacts of near-earth asteroids. Using this highly interactive approach, the activity succeeded in conveying a taste for astronomy to the participants. With tactile learning as a central piece of the workshop, children could touch a real meteorite (using gloves to protect it from their hands’ moisture). Eliana Medina, the head of the school made clear that such inclusive experiences help her students’ learning process. By deploying all of their available senses, beyond just sight, students are able to better process and remember information that experts in the field explained to them. And these enhanced learning methods can help children without disabilities as well! The students were fascinated by astronomy, took part in the discussions, asked questions and were excited to share what they had learnt that day with their families at home. One of the kids even expressed his wish to become an astronomer himself one day! Erika Labbé, coordinator of the university’s astronomy hub, pointed out that they received massive support and help from the university which has recognised the importance of inclusiveness as a fundamental human right. Projects like hers are in dire need of this kind of support if they are to be realised. Without it, they won’t be able to continue reaching audiences with special needs. But there are other challenges to consider as well when communicating astronomy that apply to all audiences. For effective learning experiences, language has to be used adequately, adapted to the context and the audience, in well-structured talks for amateurs. If done right, these measures are an important step for the democratisation of knowledge. 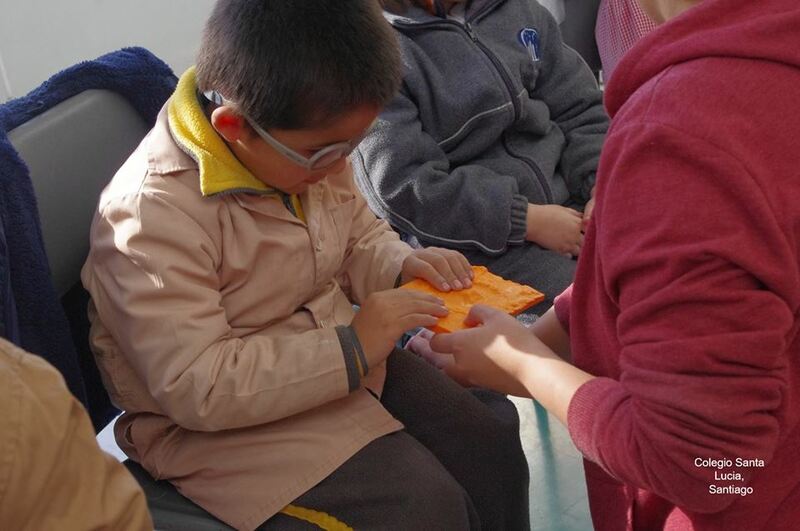 Especially in the case of blind people, well thought out workshops can help them to receive information beyond their immediate surroundings that they can perceive with their other senses, thus contributing to more abstract learning. Frustration is something these visually impaired children are used to, signalled Eliana Medina. Discovering new things that they thought were out of their reach really pushes their motivation to become passionate about a specific field of knowledge. Astronomy is a very visual field: Observations are at the heart of it and amateurs are easily excited by images of space. Therefore inclusive approaches in the communication of astronomy open the field up to a whole new group of people. For this purpose, the solution Erika Labbé found was to convert the images she normally uses when communicating astronomy into tactile scale models made of different materials. The most difficult in all of this was the representation of light, essential to the transmission of many astronomical concepts, which many of the visually impaired have never experienced themselves. She overcame this by using heat as an equivalent, pointing a heat lamp at the children’s hands which took the role of eyes hit by sunlight. The challenge lies in being open to try new things and learning from the experience of the children with these disabilities. Sometimes putting yourself into the position of someone who can’t use their sight in the same, predominant way people with full eyesight do, requires a great deal of imagination. The use of 3D models of our solar system or of an impact crater (pictured above) were the results of exactly this type of creative thinking. The impact crater was printed using NASA’s 3D crater models available to anyone. Besides opening new fields of knowledge to kids, Erika Labbé wants to open the mind of educators as well, teaching them about the possibilities of inclusion. “The main problem is that many completely ignore what it really means to have a disability and what emotional strength it takes to confront this situation for the first time”, she says. But once these barriers have been overcome, such a process becomes normal and very motivating. The most important thing for Erika is that workshops and initiatives like the one for Asteroid Day in Chile become the norm instead of remaining an exception. Only then can inclusivity succeed. We certainly support this view and salute the entire team of the Diego Portales University’s Astronomy Hub and the Santa Lucía School for the Blind for their efforts. It’s through innovative approaches like these that our campaign of awareness can reach new people and excite the next generation! But it is also an issue that we weren’t really aware of before. Therefore we invite anyone to share initiatives, suggestions and resources that can help us to reach out to visually impaired audiences or people with other disabilities. If made available to other regional coordinators and their events, such an inclusive toolkit could help them reach entirely new audiences as well.